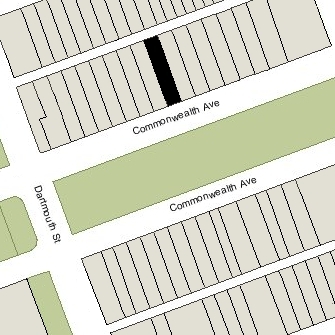 121 Commonwealth is located on the north side of Commonwealth, between Clarendon and Dartmouth, with 119 Commonwealth to the east and 123 Commonwealth to the west. 121 Commonwealth was designed by Cummings and Sears, architects, and built ca. 1872, as the home of Charles Greenleaf Wood on land which he purchased from the Commonwealth of Massachusetts on April 4, 1871. He was a dry goods merchant and, later, treasurer of the John Hancock Life Insurance Company. 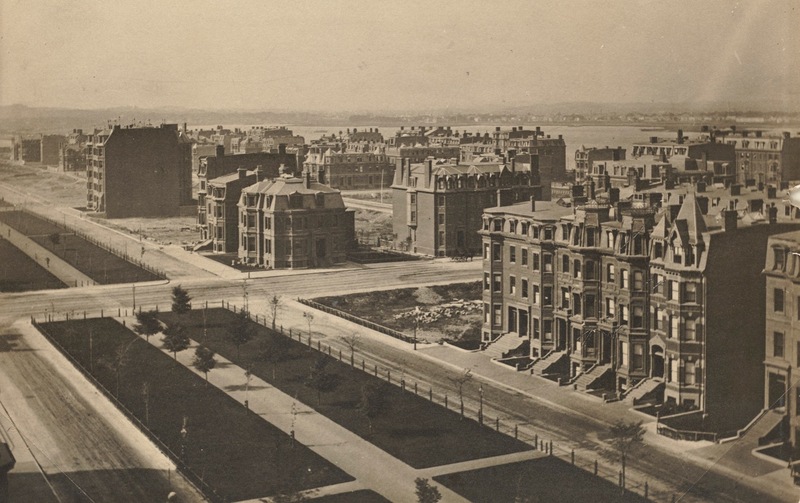 While the house was being built, he lived at 7 Beacon as a boarder, and before that had lived at 11 Union Park. Click here for an index to the deeds for 121 Commonwealth. Charles Wood was a widower and lived at 121 Commonwealth with his two children, Elizabeth Bradlee Wood and Charles Greenleaf Wood, Jr. Elizabeth Wood married in January of 1875 to Francis Richmond Allen, a dry goods merchant and later an architect. They lived at 121 Commonwealth with her father until about 1876, when they moved to 20 Fairfield. 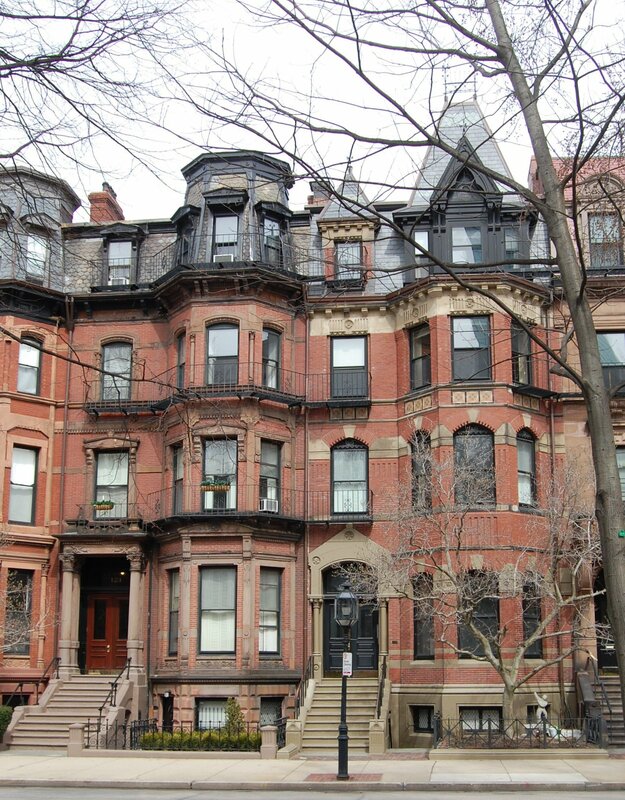 By the 1876-1877 winter season, Charles Wood and his son had moved to 11 Beacon and 121 Commonwealth was the home of John Erskine, a boot and shoe dealer, and his wife, Catherine (Walker) Erskine. They previously had lived at 30 Chester Park. 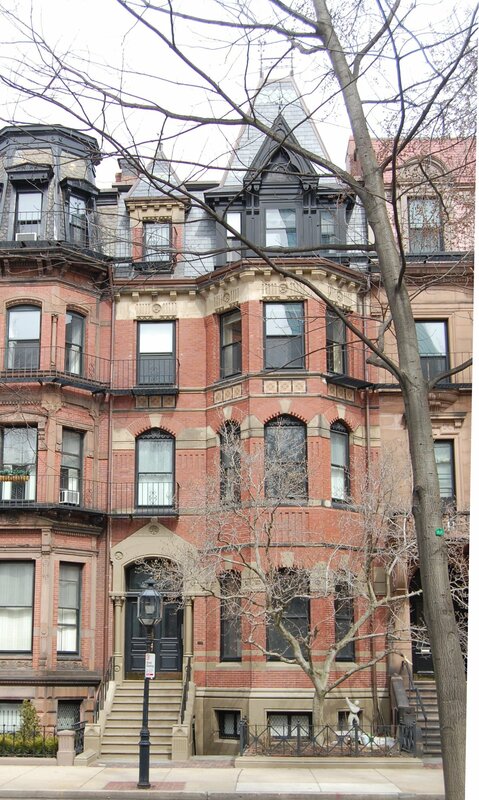 They continued to live at 121 Commonwealth during the 1878-1879 season, but moved thereafter to 125 Newbury. On July 1, 1879, 121 Commonwealth was purchased from Charles Wood by banker Joseph Norton Fiske. He and his wife, Charlotte (Morse) Fiske, made it their home. They previously had lived at 45 Commonwealth. The Fiskes were joined at 121 Commonwealth by Joseph Fiske’s sister, Elizabeth Stanley Fiske. Joseph Fiske died in January of 1892. He died intestate and had no children. His heirs at law were his two siblings, Elizabeth Fiske and George Jenckes Fiske, who was deceased, and whose interest therefore passed to his two children, George Stanley Fiske and Esther Lathrop (Fiske) Hammond, the wife of Gardiner Greene Hammond, Jr. One-half interest in 121 Commonwealth passed to his heirs at law, one-fourth interest to Elizabeth Fiske and one-eighth interest each to George Fiske and Esther (Fiske) Hammond. The other one-half interest was held by Charlotte Fiske during her lifetime, after which it would pass to Elizabeth Fiske (one-fourth interest) and to George Fiske and Esther (Fiske) Hammond (one-eighth interest each). Charlotte Fiske and Elizabeth Fiske continued to live at 121 Commonwealth. Elizabeth Fiske died in September of 1903. In her will, she left her interest in the property to Charlotte Fiske during her lifetime, after which it would pass to George Fiske and Esther (Fiske) Hammond. Charlotte Fiske died in February of 1918. 121 Commonwealth was not listed in the 1919 Blue Book. By the 1919-1920 winter season, 121 Commonwealth had become George Stanley Fiske’s home. He previously had lived at 261 Clarendon. He was rector of St. Andrew’s Episcopal Church in East Boston and also maintained a residence at 117 Trenton in East Boston. Esther (Fiske) Hammond lived with him during the 1919-1920 season. She was separated from Gardiner Greene Hammond and her primary residence was her estate, Bonnymeade, in Montecito, California. She also maintained a home in Falmouth. On October 25, 1921, Esther Hammond transferred her interest in 121 Commonwealth to her brother. George Fiske continued to live at 121 Commonwealth until his death in January of 1936. The house was not listed in the 1937 Blue Book, and was shown as vacant in the 1936 and 1937 City Directories. On March 4, 1936, 121 Commonwealth was purchased from George Fiske’s estate by C. Rankin Bingham, Albert V. Danielsen, and Charles K. Veo, trustees of the 121 Commonwealth Avenue Trust. That same month, C. Rankin Bingham filed for (and subsequently received) permission to convert 121 Commonwealth house from a single-family dwelling into a lodging house and doctor’s office. 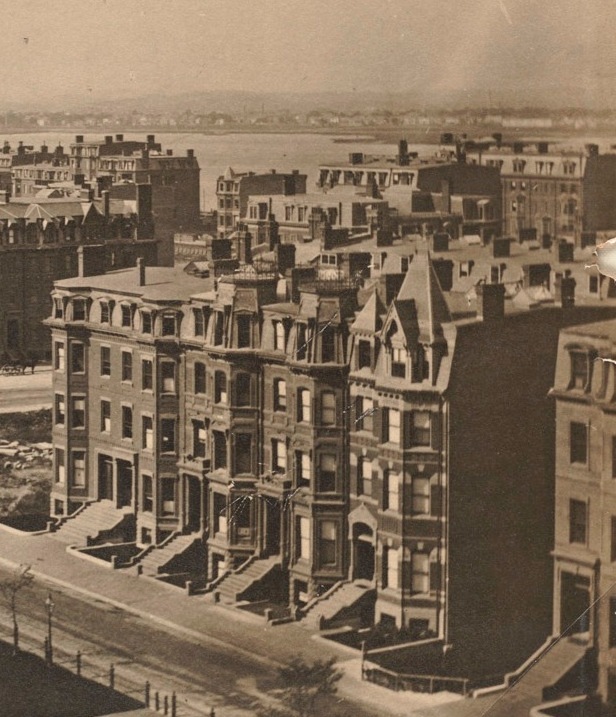 On November 9, 1937, Elizabeth (Payson) Gordon of Portland, Maine, the wife of Alexander Gordon, foreclosed on a mortgage given by the 121 Commonwealth Avenue Trust and took possession of 121 Commonwealth. It remained a lodging house. On October 21, 1940, 121 Commonwealth was acquired from Elizabeth Gordon by Herbert Augustus Horgan, trustee of the Sumner Realty Trust. He and his wife, Ada Josephine (Mahoney) Horgan, lived in Brookline. He was an attorney. 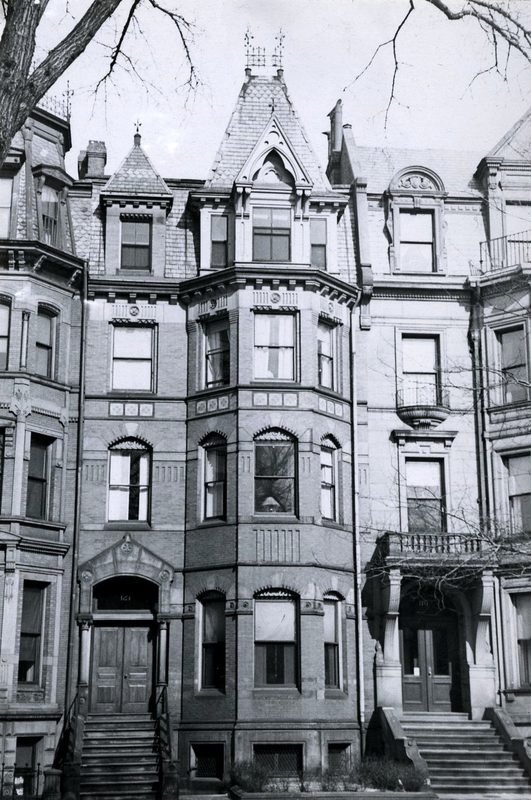 There remained a first mortgage on the property given in March of 1937 by the 121 Commonwealth Avenue Trust to Brookline Federal Savings and Loan. On December 3, 1941, the bank foreclosed on the mortgage, and on April 28, 1942, its interest was acquired by Herbert Horgan. Herbert Horgan died in October of 1957. On October 4, 1960, 121 Commonwealth was acquired from Herbert A. Horgan, Jr., as successor trustee of the Sumner Trust, and Ada Horgan as beneficiary of the trust, by David B. Kaplan and Samuel Dame. On January 23, 1963, 121 Commonwealth was acquired from David Kaplan and Samuel Dame by Carl DeMoon and Gregory DiBella. Gregory DiBella lived in one of the units at 121 Commonwealth. He previously had lived at 19 Fleet. On August 5, 1966, Carl DeMoon transferred his interest in the property to Gregory DiBella. On December 29, 1969, 121 Commonwealth was acquired from Gregory DiBella by Edward J. Goodfellow and his wife, Mary Dorine (Jewers) Goodfellow. They also owned 119 Commonwealth, where they lived. On August 6, 1976, 121 Commonwealth was acquired from the Goodfellows by their son-in-law and daughter, John DeMusis and Mary C. (Goodfellow) DeMusis. They lived in an apartment at 119 Commonwealth, which they had acquired from the Goodfellows in August of 1974. 121 Commonwealth remained an apartment house in 2016.